These are plans that represent the ground conditions, site features and elevations of a given site. They may or may not be associated with a Standard Boundary Survey. They are typically prepared for site development, architectural, landscape and civil engineering design, usually required by towns for the subdivision of land, and are subject to mapping standards set forth in Lan Chapters 100-500. A well prepared topographic survey will indicate features such as (but not limited to) vegetation type, trees, streams, wetlands, boulders and rock outcrops, existing site improvements and man-made features such as buildings, driveways, utility structures, walls and land use. 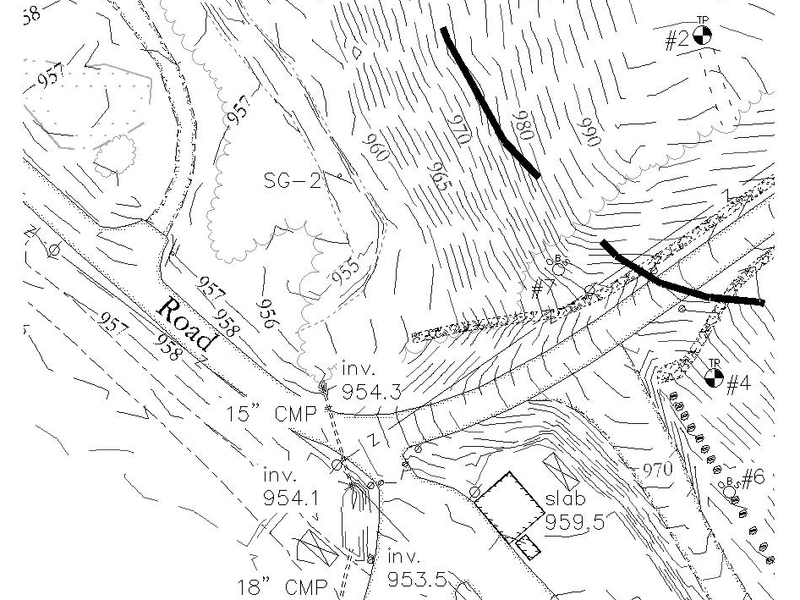 Site elevations are represented with contour lines which are lines drawn on the plan that "trace" a fixed elevation. A familia r type of Topographic Map are the USGS "Quadrangle" maps which usually represent topography with a contour interval of 20 feet. A detailed engineering plan will normally represent contour intervals of 2 feet, or sometimes 1 foot where great detail is desired, while a typical contour interval for a subdivision plan would be between 5 and twenty feet depending on lot size and individual town requirements. A topographic survey is prepared by making measurements to gather elevation data at key locations such as stream beds, breaks in the terrain slope, road center lines and shoulders, ditches, high points, low points. Contours are drawn by interpolating between these points to generate lines along the locations of the even, fixed elevations. The smaller the contour interval, the more data must be gathered, and commensurately, the more expensive the project will be. Experience results in the efficient gathering of data in locations that will result in an accurate ground representation. Larger sites upon which the ground is not excessively obscured by vegetation can also be mapped quite accurately by photogrametric ("aerial mapping") methods, but some site features such as wetland areas or subtle ground features must still be mapped by conventional methods on site. The topographic survey can then be used as a base map upon which site alterations can be designed, such as roads, parking lots, athletic fields, buildings, etc. they are also required for gravel pit reclamation, or for calculating volumes of earth to be removed ("cut") or added ("fill") to a site. Typically, the base map is known as the "Existing Conditions Plan", while a plan showing site design and proposed features will be known as a "Site Plan".